On Sunday, March 8, 2009 the outstanding Alabama blues musician Willie King passed away near his home in Old Memphis, Alabama, following a massive heart attack. His career started on a plantation with a one-string, homemade diddly-bo. Six recordings and a DVD later, along with numerous national and international festival performances, Willie King has gained a substantial national and international reputation. Ever since he first heard a blues musician play at this grandmother’s juke joint over sixty years ago, Willie King has been consumedby the blues. His life story is about great music but equally it is about care, interest and concern for the community he grew up in - King's own definition of the "blues life." The loss of this great blues man is still deeply felt by fans and musicians all over the world who have been touched by his unique juke joint blues and uplifting message of peace, love and social justice. The funeral took place on Sunday, March 15th at 2pm at the City Hall in Aliceville, Alabama. A wake was held the day before on Saturday, March 14, from 1 - 3 pm at Lavender's Funeral Home.Please see Willie King's Guest Book for appreciation and comments. See the Tuscaloosa News here, here, here and here for reports and video. Also reports at the Commercial Dispatch and Tuscaloosa News video interview with Rick Asherson. Willie King is buried at the Spring Hill Baptist Church, just the Mississip side of the state line, on Prarie Point Road. If you drive through Aliceville, you will pass his home in the community of Old Memphis, a turning called Wille King Drive, off Alabama Route 32. Willie King was inducted into the Black Belt Hall of Fame on March 16th, 2012, in Livingston, AL, along with George Wishington Carver and other Black Belt luminaries. Willie touched the lives of so many with his amazing, spirit, music and message and it is so important and wonderful that his legacy continues to be recognized. Dutch film-makers Saskia Rietmeijer and Bart Drolenga of Visible World Films came to America with the intention of producing a documentary about African American arts and culture in the deep South. When they met Willie King, they decided instead to devote their efforts to creating a DVD about Willie's life and times. 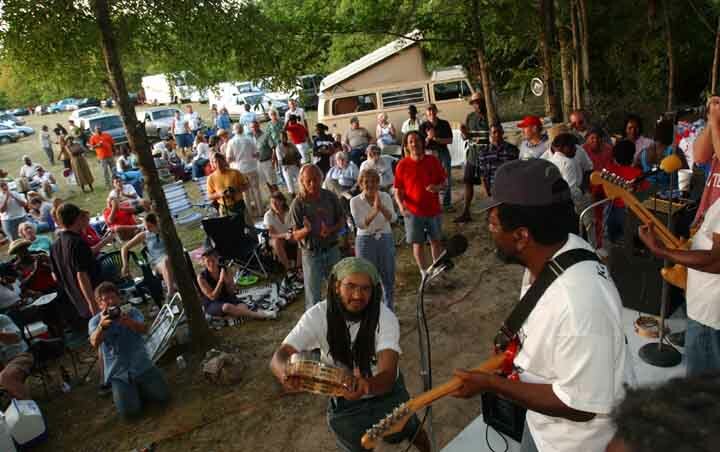 Over a period of several months, the couple recorded Willie King as he worked with his community in Pickens County and performed at festivals, juke joints and parties. The DVD is a fascinating collage of Willie King's life and many activites, illuminated by searing live performances and interviews with his family and friends. It enables the viewer to experience what it is like to be a modern bluesman living in the Alabama Black Belt, "down in the woods." Click here to get your copy now!!!!! Willie King on the Blues and "Terrorized"
Willie King inducted into the Howlin' Wolf Hall of Fame. Special thanks to the Howlin' Wolf Blues Society. Willie King wins the 2004 Living Blues Magazine award for "Blues Artist of the Year" and is nominated for "Best Live Performer"
There's plenty of record reviews out there, including All About Jazz and mnblues. Freedom Creek, Willie King's debut album on Rooster Blues Records, was King's powerful introduction into the wider music and blues world. Not only was the album acclaimed by critics worldwide, it also received awards from Living Blues Magazine for Best Male Blues Artist (2001), Best Blues Album (2000) and Best Contemporary Blues Album (2000). Willie King was born in Prairie Point, MS, in 1943. After his father left the home, Willie and his siblings were raised by his grandparents, who were local sharecroppers. Music was important to the King family - Willie's grandfather was a gospel singer, and his absent father was an amateur blues musician. Young Willie made a diddley bo by nailing a baling wire to a tree in the yard. By age 9, he had a one-string guitar that he could bring indoors to play at night. In 1967, Willie King moved to Chicago in an attempt to make more money than he could down South. After a year spent on the West and South Sides, he returned to Old Memphis, Alabama, just across the border from the Mississippi Prairie. A salesman - of shoes, cologne, and other frivolities - Willie traveled the rural roads hawking goods and talking politics. Choosing not to work under the "old system" of unequal treatment, King joined the civil rights movement near the end of the decade. In 1987, a chance meeting at a festival in Eutaw, Alabama, blew Rooster Blues founder Jim O'Neal away: According to O'Neal, King's "juke-joint musical style and political lyrics knocked me down." The two kept in touch for the next 13 years, during which O'Neal relocated his label, and King concentrated on his own community, forging relationships with local youth through a blues education program, through his organization The Rural Members Association. The Rural Members Association has sponsored classes in music, woodworking, food preservation, and other African-American traditions, and has provided transportation, legal assistance, and other services for the needy over the past two decades. In recent years he's been sponsoring a festival on the creek, which is known as The Freedom Creek Festival. Willie explains, "We was targetin' at tryin' to get all walks of life, different people to come down and kinda be with us in reality down there, you know. Let's get back to reality, in the woods . . . mix and mingle . . . get to know each other. Get up to have a workin' relationship, try to bring peace . . ."
King's follow up, Living In a New World, is nothing short of spectacular. Produced by Jim O'Neal and recorded at Easley Studio in Memphis, the album reminds the listener of Curtis Mayfield while allowing RL Burnside fans to rejoice as well. In addition to the two CD's on the Rooster Blues label, Willie has also four independently recorded CDs - Walkin' the Walk, Talkin' the Talk which was recorded with local Alabama bluesman "Birmingham" George Conner, and the widely acclaimed I Am The Blues. Jukin' At Bettie's was recorded live at Bettie's Place, a deep South rural juke joint. His last recording was One Love. Most of these CDs are available at Willie King's CD Store or can be downloaded from iTunes, Amazon and other digital distributors. CONTACT For questions, comments or any other information, please send us an email or phone in the USA at (205) 366 1307.